Royal Tree Lodge accommodates guests in the choice of luxury tents, honeymoon chalets or a private villa. Royal Tree Lodge's main thatched complex consists of a bar, lounge, entrance hall and dining room, lots of space, stylish furnishings, and large windows. Off to one side is a swimming pool, surrounded by a stunning teak deck. Behind this Botswana lodge is a very unique guest toilet. These Maru-styled safari tents are built on a raised deck made from exotic hard wood and are placed under a canopy of trees for privacy. All have en-suite toilet facilities and outdoor showers for the more adventurous guests. From the raised deck, guests have an amazing view of the African Forest. 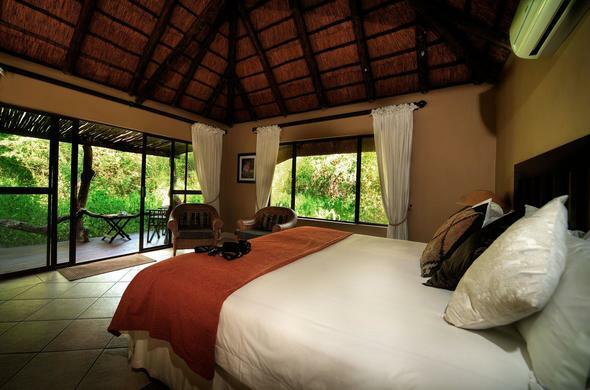 Each Honeymoon Chalet is set in a secluded and private area of the reserve, with king sized canopy beds. Each chalet is fully furnished with deep sunken baths, stunning candles and a outdoor shower. This luxuriously secluded house, accommodation six to eight guests, is situated on the corner of the reserve, consisting of 2 en-suite bedrooms and a detached cottage. The stunning furnished lounge opens up onto a large thatched patio, ideal for outside dining. The spacious kitchen leads into the dining area where you can enjoy amazing views of the lush gardens. With this private villa guests also have amazing views of zebra and eland at the floodplains and grasslands from their own private pool area. Royal Tree Lodge offers the best accommodation in the Maun area. The cottages boast an en-suite stylish bath inside with an open-air shower.